Here is the third look of the remix. This time I went for a much more casual rough around the edges effect, especially my hair. That is what happens when I let it go for too long. After a full day of hot humid air, my hair has no chance. But that’s OK because clean and polished hair wouldn’t really look right with this outfit. This is definitely one of those running-errands-on-the-weekend-but-still-want-to-look-chic-so-I’ll-wear-my-heels look. 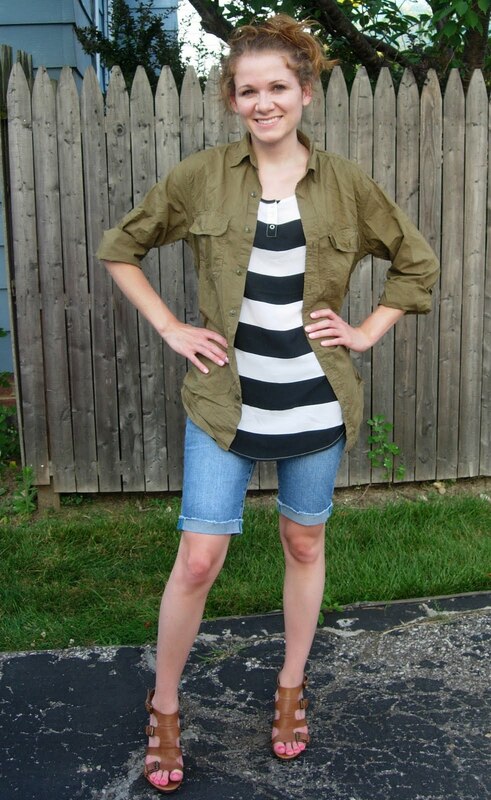 I got my inspiration for the outfit from J.Crew’s summer catalog. I thought it was a pretty good attempt at recreating the look. Although I wish I had the cool jacket the model is wearing. See all three looks here and click on the star to add me as your favorite. love the outfit and inspiration!